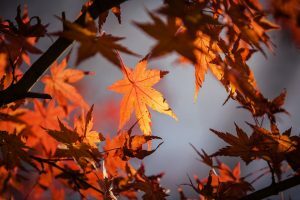 The display of color we enjoy each fall is explained by understanding plant pigments, the physiology and anatomy of leaves, and the influence of climate and seasonal weather conditions. Fall weather conditions favoring formation of bright red autumn color are warm sunny days followed by cool but not freezing nights. Check out the Why Leaves Change Color publication for the answer along with other hardwood tree information.